Young children learn by doing, and “active play” includes both structured and unstructured activities. 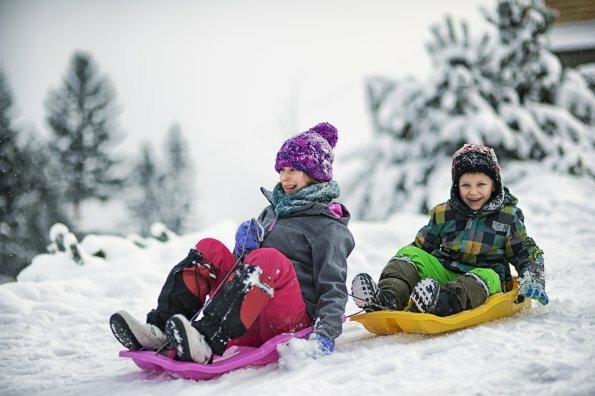 If there’s been a snowfall and children play in the yard piling up the soft snow and rolling down the pile, that’s unstructured play. Later, when the weather warms a bit, they find that the snow has become sticky and they can create snowmen. This is also unstructured. Structured play is when an adult creates a stimulating environment and children are encouraged to explore. But what can be defined as “structured” differs depending on the age of the child. 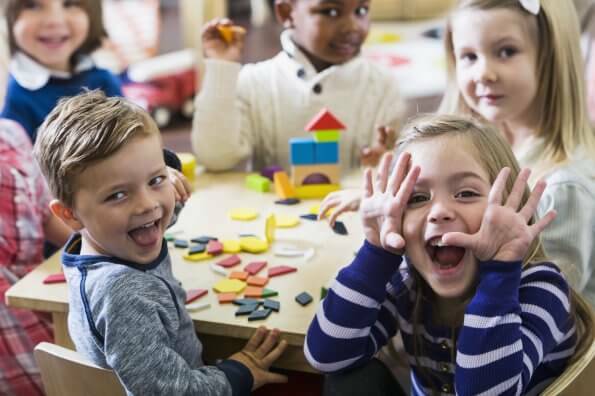 Preschool children (up to 5-years-old) learn best when there is no “teaching” of skills directly because, cognitively, they struggle with rules. For younger children, structured play means providing rich stimulating environments both indoors and out. A stimulating indoor space provides different types of balls, cones, skipping ropes, hoops, low balance beams, soft and hard surfaces, and small climbing structures. 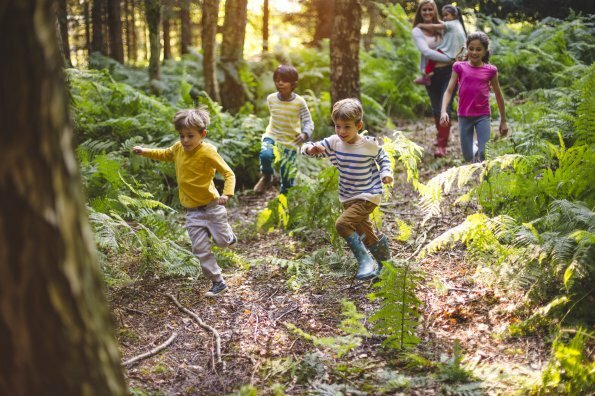 Adults support the children’s exploration by being active role models: engaging in the play themselves and demonstrating different ways of playing. For preschool children, it’s not essential that they throw a ball with the correct arm and body movements. Instead, it’s important that they are confident about throwing and rolling balls in a variety of different ways: short and long distances, into a garbage can, over a bookshelf, across the floor. Technical throwing skills will develop when children are older, as long as they’ve learned that they can have fun doing it! A stimulating outdoor space for preschool children includes playground equipment (swings, climbers, ropes, and so on) but can also be a natural environment with hills to climb up and roll down, small ditches to jump over, low walls to walk along, steps to jump from, and piles of leaves to throw and jump into. The outdoors provides opportunities for children to learn to move through the different environments of snow, ice, water, ground, and air. Both indoors and out, a stimulating environment encourages children to be active and explore their abilities. It supports their motivation to move and helps to develop both confidence and competence (the definition of physical literacy). For preschool children, instruction should be limited to thinking about how to be safe: wearing a sunhat and sunscreen, waiting their turn on the slide, not pushing others while on the low wall. They can also start to think about managing risks for themselves: can they really climb so high or jump from such a high place? 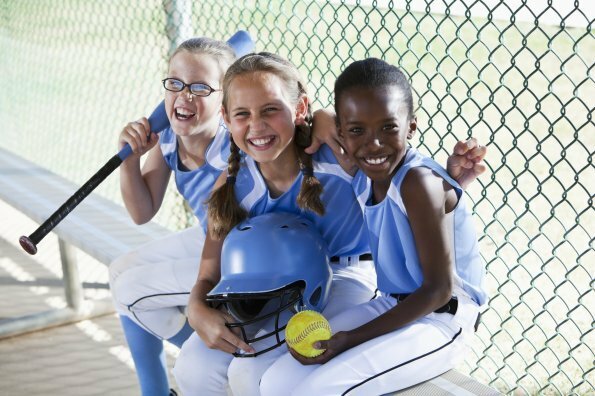 Older children (ages 6 to 12) can benefit from direct instruction in sport or other activities. At that age, they are ready to learn ball-handling skills in soccer or develop their skating skills for hockey. This is the time to put children in more structured programs such as lacrosse and ringette, or lessons such as swimming and gymnastics. But that shouldn’t be all children this age do to develop their fundamental movement skills. School-age children still benefit strongly from having the opportunity to simply explore and challenge themselves, learning about what their bodies can do. This is the kind of learning that happens when children gather on their own to play a scrub softball game, play street hockey, or explore a natural environment, all without adults organizing, refereeing, or coaching. Even in structured coaching programs, older children learn a great deal when they are allowed to explore the equipment of the sport and simply “play” on their own without adult direction. In fact, in some programs, children under the age of 10 spend their practice time playing related “games” structured to help them develop the required skills to play more effectively when they are older. They then use these skills in scrimmage games at the end of each practice. This way, all children are actively engaged in developing their skills throughout the entire practice. Many parents and early childhood educators feel they can’t help their children with physical literacy because they don’t have appropriate education or the skills themselves. That’s the beauty of pursuing physical literacy through active play. 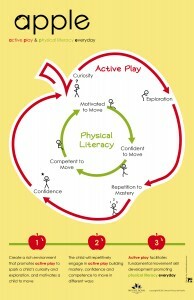 The APPLE Model (Active Play and Physical Literacy Everyday!) 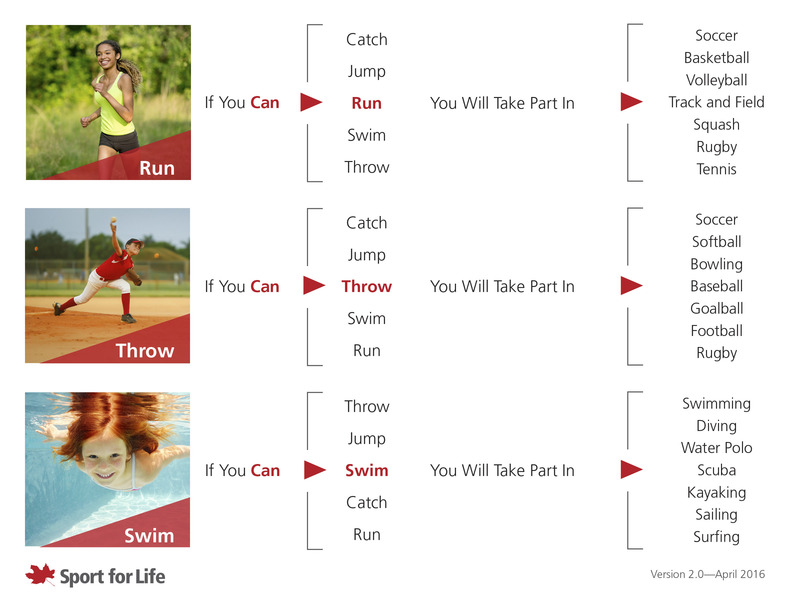 shows how closely the concepts of physical literacy align with active play. 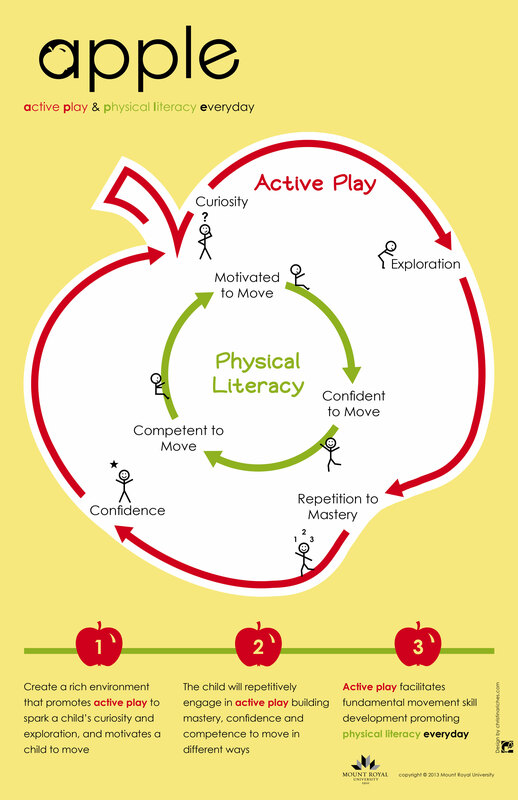 Physical literacy forms the core of the apple. It can be developed through active play as represented by the skin of the apple: curiosity, exploration, repetition to mastery, and confidence. As children move around the cycles, they gain confidence and competence, become more willing to challenge themselves, develop mastery, and are eager to move around the cycle again and again. Fundamental movement skills (FMS) are the basic skills that children develop in the early years through active play. The chart to the right, developed by Sport for Life, shows why it is so important to encourage children to develop fundamental movement skills in the early years so that they can confidently and competently participate in sport activities throughout their lives. 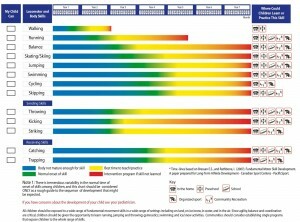 Preschool children can develop FMS beginning in infancy. 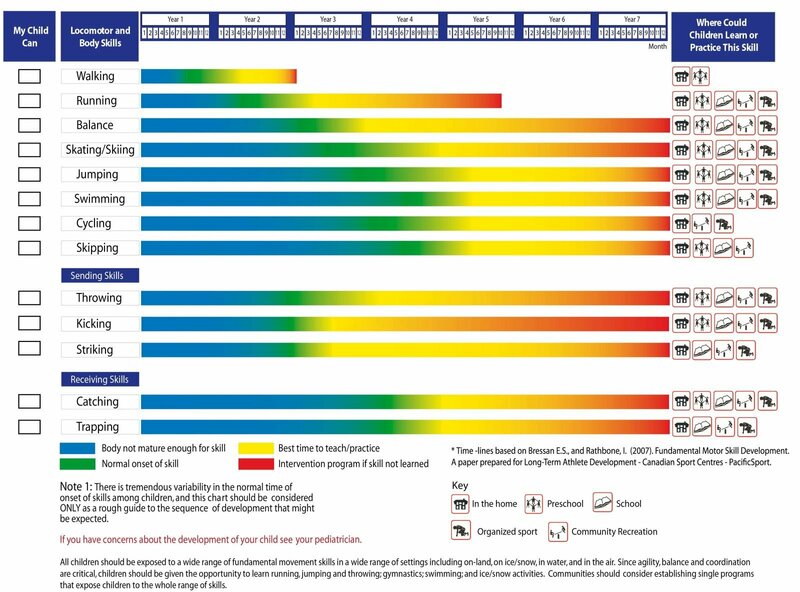 The colourful chart to the right, adapted by Mount Royal University from Canadian Sport for Life, shows developmentally appropriate timing for young children to develop basic FMS. Play helps children in their holistic development. It makes them stay away from stress, stay fit and learn new things. Therefore, children must always be encouraged to take part in playful activities. Thanks, Craig, for the note. We know it as “scrub”, too. I think “scrum” slipped past our editing eyes. Now fixed.